Dr. Eugene Chang works in his lab with staff. In 2014, the Bunning Food Allergy Professor Cathryn Nagler and her team discovered a potential treatment for food allergies. Hoping to commercialize her discovery but having limited experience in business, she approached the Polsky Center, where she was introduced to John Colson, then a postdoctoral scholar at the UChicago Institute for Molecular Engineering. Over the next four years, Colson and Nagler worked closely with staff of the Polsky Center to launch ClostraBio in 2016. With Colson working full-time as the program manager, the company has raised over $3M to date. Like ClostraBio, several other life sciences companies built around UChicago faculty research have been successfully launched and funded through the recently-formalized Polsky Life Sciences Launchpad. The Launchpad bridges the gap between academic research and entrepreneurship by forming hands-on partnerships with life sciences researchers who seek to convert their research products into business ventures. 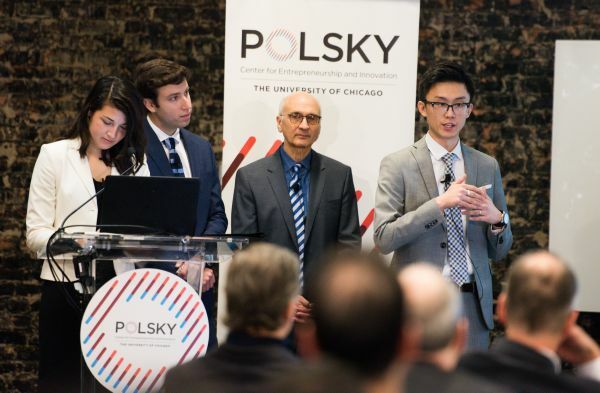 The Polsky Center has worked with researchers at the University to commercialize their discoveries and ideas for years, but there have not been staff dedicated to launching life science startups until the formalization of the Polsky Life Sciences Launchpad program. Polsky’s Matt Martin, MBA ’18, head of the Life Sciences Launchpad team, remarked, “launching companies based on life science research requires specialized skills, so we augmented our team with experienced venture leads and with life science focused entrepreneurs.” The role of the new Life Sciences Launchpad program is to serve as a kind of “cofounder” alongside the faculty members for these new business ventures, and to work closely with them throughout the launching and early operation of their companies. Of course, the Launchpad is closely integrated with many other resources and programs managed by the Polsky Center. Launchpad staff actively assist life sciences researchers to navigate and take full advantage of the vast array of Polsky offerings so that they can achieve their business objectives. When working with the Life Sciences Launchpad, the faculty member typically works with a Polsky Center venture lead and a technology venture fellow. The Polsky venture lead is a full-time employee of the Polsky Center and serves as an extension of the founding team of the new business so that the team can get started on the right track for launching. Meanwhile, the tech venture fellow ideally becomes embedded in the new startup as part of the founding team and focuses on the operational side of the company. To fill these tech venture fellow positions, the Launchpad recruits from recent University of Chicago Booth School of Business MBA graduate students and former postdoctoral scholars in the life sciences . These fellows are then offered stipends to work full-time with the faculty members as they help launch their companies. Polsky tech venture fellow Kevin Lei presents on Covira Surgical, a startup based on the research of Dr. John Alverdy, at the George Shultz Innovation Fund 2018 Fall Cycle Finals. Eugene Chang, the Martin Boyer Professor at the Department of Medicine, is one of the faculty members that works with the Launchpad. 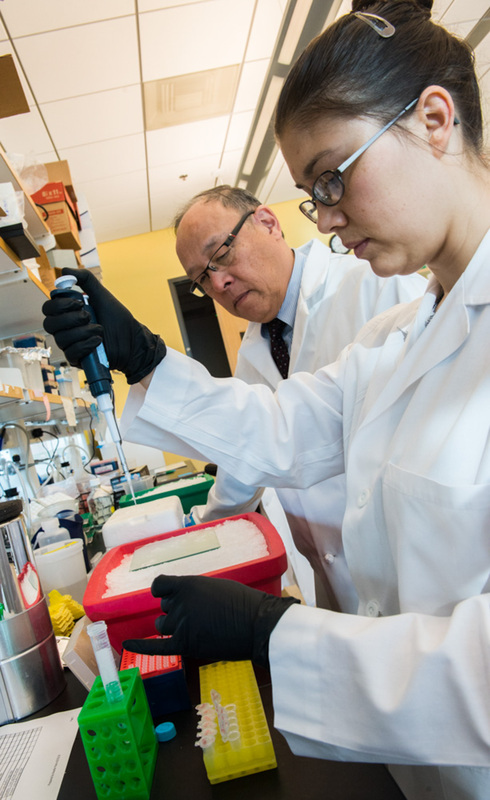 Dr. Chang and the Launchpad successfully launched a startup, AVnovum Therapeutics, in 2017 based on Dr. Chang’s research and have received $150,000 in funding from the University of Chicago’s George Shultz Innovation Fund. Dr. Chang admitted that AVnonum would not exist without the help of the Polsky Center. “I didn’t become a clinician and a researcher in order to start companies. But, of course, I want patients to benefit from our discoveries, and this is where the partnership with the Polsky Center has been so valuable. They really enabled us to launch AVnovum,” commented Dr. Chang. Tech venture fellows bring their business or science expertise to the founding teams to help identify commercial risks associated with the technology, prepare pitch decks for the venture, and seek out private and public sources of funding. Furthermore, because the life sciences are extremely specialized fields, they possess the unique ability of someone who can combine entrepreneurial insights with scientific knowledge. Martin noted that one of the Launchpad’s tasks is to develop and grow this kind of talent base in the Chicago area. Over the past five years, there has been increasing interest from the science community in the “business of science.” Many PhD. students and postdocs who enjoy the sciences are switching gears towards applying their scientific knowledge to business and entrepreneurship instead of staying in academia. Judy Prasad was a postdoctoral scholar at the University of Chicago neuroscience department. Now, she works full time as a Launchpad tech venture fellow to help manage AVnonum Therapeutics, a biotech startup specializing in the prevention of infectious disease — the company started by the Launchpad and Dr. Chang. Prasad said that her experience with the Launchpad has been very rewarding. As a venture fellow, she is able to learn how to run an emerging business at the forefront of academic discovery and commercial innovation. Prasad believes that tech venture fellows at the Launchpad are important in connecting the academic discovery with business innovation. So far, the Launchpad has worked on about twenty different projects and have successfully launched five companies. Furthermore, they expect to launch five more companies over the next 12 to 18 months.